Tweens may not be overly familiar with the cultural delights of the 'before time.' It is mostly all about the Fairly Odd-Parents, Adventure Time, and Gumball for the modern tween. But, those who grew up in the '80s and '90s know that there are plenty of sources of heartwarming entertainment of which the young lads and ladies of today are sadly unaware! If only there were ways to vicariously bring them back! Well, that's kind of a trick sentiment, since it's pretty clear that we've figured out a way. One might have thought that we befriended a buddy with some time traveling powers to bring forward our animated eighties... and, technically, we have definitely done exactly that... but we had no need for a vintage revival this time around. The Care Bears are eternal and always up for answering the dreams of the kindly folks down here. 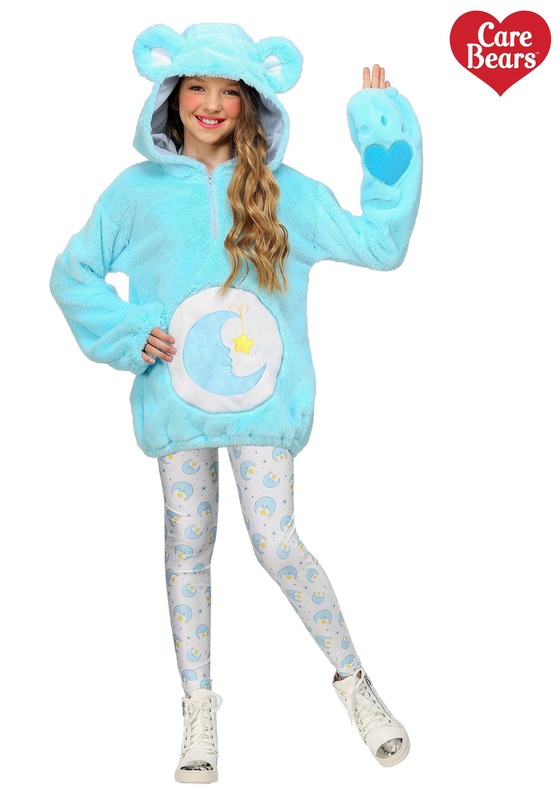 Answer the dream of the past generation with this Care Bears Deluxe Bedtime Bear Tween Hoodie Costume. This comfortable polyester hoodie features faux fur of the brightest sky blue all in the image of the delightfully nappy Bear, himself, Bedtime Bear! The included leggings feature the moon and star printing all over its design. The hoodie, however, is the real focus of the costume. Its hood pulls up to show off giant fuzzy ears and the embroidered belly features the sleepy Bear's power symbol. Just because we haven't heard much from the Care Bears in the recent decades doesn't mean that they aren't still up in the clouds, looking down and trying to bring happiness and good cheer to the world. You can prove them to be alive and well when you channel the power of nice naps with this Bedtime Bear Deluxe Tween Hoodie and remind the world how amazing the Care Bears were! The tights were so see thru and thin there was no way my daughter was going to be able to even wear these out let alone stay warm. And the top part of the costume was basically a blue sweater equally as thin as the tights. Making it almost impossible for her to stay warm. It didn't even have bear hands like it looked on the picture. The bag it came in was opened and didnt even recieve a receipt or anything not sure if it was new or used. Overall not was I was expecting and dissatisfied would probably not recommend.